Normally we call these posts “Everything You Wanted to Know About…”, understanding that, even with weeks (and sometimes, months) in a country, these titles are perhaps a shade hyperbolic. Probably a more accurate title would be “A Small But Important Fraction of What There is to Know About…”, but even if that latter title has a greater ring of truth, it’s also a pain in the tookus to type out, so we’ll be sticking with our original series title. Except when it comes to Brunei. We only spent 3 days in the country and, moreover, only visited the capital city. Even though both Tony & I were rather bowled over by just how little there was to see and do in Brunei and 3 days spent there felt more than generous, I’m still leery about pretending (even in just a titular capacity) that we have anything more than the most superficial of insights into the country. We didn’t CouchSurf or really mingle with any locals while there (seriously, the whole country seemed deserted), so ultimately we both felt the only thing we could speak to with any authority is how much our time there cost. We’ll pepper in a few tips and tricks where applicable, but just like Brunei itself, this post is all about the money. So with those caveats aside, let’s get down to our socks because it’s business time! 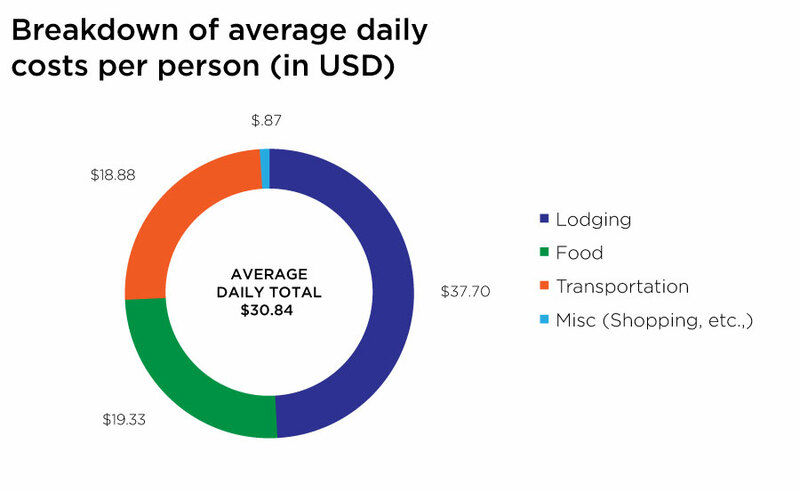 Projected Daily Budget, per person: We didn’t have a budget pre-determined for Brunei as we didn’t originally plan on visiting. However, if we went with our overall trip budget of $50/person then we were $20 (per person!) under budget! Other costs of note: None, though it is worth mentioning that in addition to using the local currency, the Bruneian dollar, the Singapore dollar is also accepted at face value. A Note On Daily Costs: In our daily costs, we have separated out the cost of our transport into Brunei. We did this because we believe that including the price of getting into or out of a country results in a figure that does not accurately reflect our actual day-to-day costs. Moreover, not everyone will choose to enter the country in the same way or from the same departure point as we did, so we include the price we paid separately for your edification. We believe our Lodging, Food, Transportation, Attractions, and Miscellaneous Shopping costs are reasonable estimates that may be informative for other like-minded travelers; however, we believe the cost of our transportation into any country is best considered a separate lump sum expenditure, and we will continue to treat it as such. Accommodation: Approximately 50% of our budget was taken up by lodging costs in Brunei. I wish I therefore had better things to say about the digs on offer at the budget end of the spectrum in BSB, but sadly I do not. Though our stay in the country wasn’t long, we stayed at two different establishments. The first was a boutique hotel that purportedly placed a high emphasis on art. Unfortunately it seemed as though the entirety of the budget had been spent on the furnishing and design concepts in the common space rather than the room itself; every room had its own theme and we can only assume that our was “CSI: Crime Scene”. There were cigarette burns in the sheets and the ghostly remains of gouts of unidentified fluid sprayed across the walls and tv. We stayed one evening and then moved to a hostel that was just across the street from the central bus station. It was severely lacking on charm, had no WiFi (nor toilet seats in the bathroom), but was marginally less expensive. Based on our experiences (and having since spoken to a fellow traveler who lived in Brunei for a few years), the relative low numbers of tourists means lodging options are quite limited throughout the country, even in its capital city. Moreover, there’s little competition so even less incentive to keep prices down and standards high. Pickings for less than $20US pp per night are anemic at best and will invariably be quite grim. This might a place where it is better to splurge and live like a sultan for a few nights, because this is a country where accommodation at the lower end of the budget spectrum represents very poor value for money. 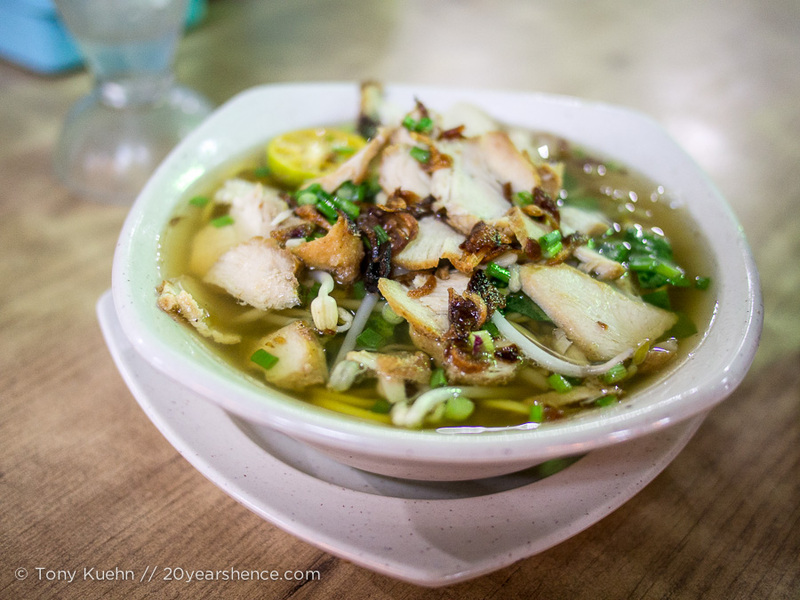 Food: Like most of Borneo, the food in Brunei was unremarkable and essentially identical to what we found in neighboring Sabah and Sarawak provinces. Although we hoped to uncover some national specialties, most of our meals involved bowls of soup, sticks of grilled satay, and Indian dishes. Food costs were comparable to the rest of Borneo, and though not spectacular, wasn’t terrible value as we averaged about $5 US pp per meal. We did stick to smaller local establishments and the rare bite of street food, which definitely kept our costs lower. Note that Brunei is a DRY COUNTRY meaning that alcohol is not sold anywhere! Bad for keeping spirits high (ha! ), but good for keeping costs down. Transportation: Brunei isn’t a very big country and most of the main sites in the capital city are clustered around the central business district so we primarily walked around the city. This kept our costs down but the downside to this strategy is that it was incredibly hot during our visit so there is only so much wandering around in oppressive heat that a person can stand. When heat exhaustion threatened, or on the few occasions we wanted to visit an attraction that was further removed, we relied on the local buses. These cost a flat $1 in the local currency (~$0.80US) to ride and are generally well connected around the city, at least for reaching the major sites. Most Bruneians have their own cars so not many locals take the buses (which are honestly quite run down), and they stop running by 8 pm. After this time, you must rely on taxis, however none of them are equipped meters, so we avoided the need to haggle by simply sticking close to home later in the day. There are posted bus schedules and routes, but they were largely incomprehensible to us. We got around this by researching the places we wanted to go and finding out in advance what line we should take and then asking around a lot once at the bus station. 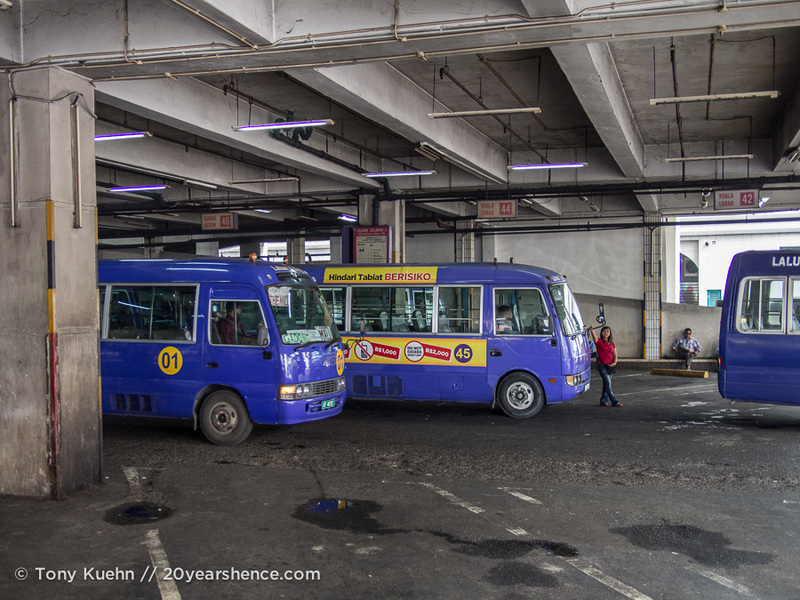 The nice thing about staying near the central bus station is that all routes wind up terminating and starting from there so getting home was never a problem. Note: To reach Brunei, we took a ferry from Kota Kinabalu in Sabah province, that stopped briefly en route on the island of Labuan. To depart Brunei, we elected to take a bus to Miri, located in Sarawak province. Attractions: There may not be all that many attractions in Brunei or BSB, and only a few of them will really wow you, but their general mediocrity is compensated for by the fact that all of them seem to be free. It’s hard to complain when your biggest cost in visiting a place is transport to and from the premises. We didn’t do absolutely everything on offer in the city, but check out this post to read about the sites we felt were most worth visiting in BSB. Remember that Brunei is a fairly conservative Muslim country and so modest dress is expected at most sites, especially the religious ones. Women will be provided with full robes and headscarves when visiting the mosques. 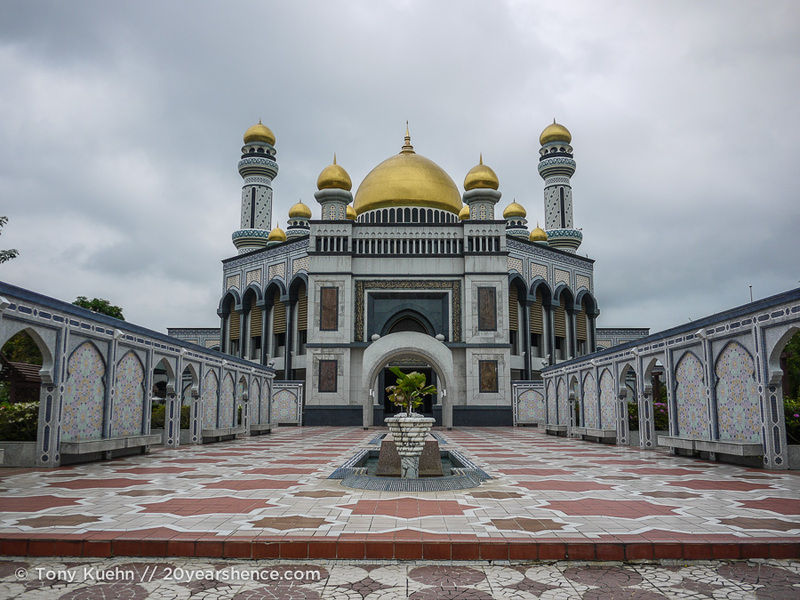 I won’t lie: we were pretty underwhelmed with our visit to Brunei. It’s not a bad country by any means, but we didn’t find it particularly interesting (an alternate title to our last post was “Why Brunei?”) and neither of us is chomping at the bit to revisit any time soon. Maybe if we had met some locals or strayed outside of the capital our opinion would be different, but based on our reading, there wasn’t really much to entice us further afield. 1. As one of the richest countries in the world, Brunei is known for decadence. Budget hotels weren’t particularly cheap, so I think we probably should have just gone big, doubled (or even tripled) our lodging budget and stayed somewhere swanky to get a taste of that life. 2. After leaving Brunei, we learned that it is supposed to offer some really excellent, but relatively inexpensive scuba diving. It’s hard to muster the enthusiasm to visit again for any other reason, so I wish we had taken advantage of this while we were there. Chewing the Fat with Ways of Wanderers! I had a pretty good laugh about the CSI: Crime Scene theme room. Sounds like it is indeed better to dish out more for accommodation to enjoy the swanky side of Brunei! We are used to making do with pretty basic/charmless rooms because we’d rather splurge in other areas, but the Crime Scene room in Brunei was a new low, that is for sure! Definitely wish we had just spent more and had an experience to remember in a GOOD way! I guess at the end of the day you can just look at this as another adventure! The lack of toilet seats is, unfortunately, pretty common in Asia, so while it’s annoying, it’s preferable to unidentified fluids, that’s for sure! Brunei seemed to be really bad for wi-fi, actually. Maybe everyone just has smartphones with data plans? To be honest, we never really thought of visiting Brunei either… but then since we were all the way over in Borneo anyway, we figured we might as well pop in and see what was going on. It may not have been our favorite country we’ve ever visited, but we’re both still glad we stopped by for a little while. I can understand why you’re underwhelmed. Brunei and BSB in general are known in ASEAN as the quietest places in the region. Even as a Singaporean (and with, like you said, currency parity with Bruneians), Brunei is rarely visited. If you ever visit Brunei again, try going to Temburong (the part of the country separated by Malaysia). It’s a great place for trekking and any kind of jungle outdoor activity. There’s also Ulu Temburong National Park, which possibly has the most pristine rainforests in all of ASEAN. Thank you for your thoughtful comment and suggestions, Yap. We knew that we definitely did not see all that Brunei has to offer, and it is nice to have some alternative destinations for others who might visit, or if we should ever return. We hadn’t really considered that such an oil-rich country might have beautiful forests and jungles worth exploring, hence why we focused our visit on the capital city which we thought would best encapsulate what the country was about. If we ever return (and we never say never over here! ), we’ll know we can skip BSB fairly confidently and spend our time exploring other parts of the country instead. Yes, Brunei is one of the few places we’ve been that: 1) we routinely forget we’ve visited; and 2) we have no real desire to return to any time soon! I can’t say we regret going there—we were in the area and if we’d not gone, we would always wonder—but it’s definitely not one we are racing back to or urging others to add to their travel lists! BSB is actually Brunei’s administrative area so there’s obviously not much of a tourism site except for it’s rich sightseeing into the Bruneian Identity and culture. Most typical westerners would have stayed at Brunei’s prestigious hotels mostly located at the Jerudong area which is also known as an expatriate & elite area of Brunei and view the breathtaking view of ASEAN’s most luxurious hotel which is the Empire Hotel and Country Club and tourist would go to Brunei’s commercial area which are the Gadong/Kiulap known for it’s tasty mouthwatering food at the Gadong night market. I’m sure every tourist will approach every destination differently and there is much we probably could have done to improve/enhance our experience in Brunei. All I can say is that we actually referenced guide books aimed at foreigners for planning our visit and we definitely don’t gravitate towards “elite” travel. Thanks for the tips; hopefully they will be useful to any future visitors! Wonderful write up you have here, Stephenie! I’ve been digging articles about Brunei, and yours by far is the most detailed I’ve seen. There’s not a lot of info available for Brunei and your article will definitely help a lot of travelers like myself! Keep it up! A great tip for any first time traveler to anywhere………….. Get in touch and befriend as many locals through social-media/forums beforehand. You will not miss much what locals there gravitate to during their leisure time. What’s more you’ll get to see real people’s attitude and culture, real everyday cuisine etc. As you said Bruneians tend to own and drive their own cars, I bet if you knew someone beforehand they’ll gladly give you a ride around town, heck even the whole “small” country. That is the nature of a lot of Bruneians. And if they have a spare room at home, and they feel they know you enough to feel comfortable about it, you may even get to stay at their place for free. Wish i could get a free visa to travel to Brunie.